When Escape from Tomorrow premiered at January’s Sundance Film Festival the assumption was that the Park City screenings and maybe a handful of appearances at other festivals would offer audiences the only opportunity to ever see this sinister take on the Happiest Place on Earth. You just don’t mess with The Mouse and in making his film on the sly at Disneyland and Disney World, writer/director Randy Moore courted an almost certain cease-and-desist order. Apparently, miracles do happen. Escape from Tomorrow is out in theaters and available VOD, affording everyone the chance to visit one suburbanite’s visit to hell, Disney-style. Moore may be onto something here, finding none of the warm, family fun the Disney marketing machine promises. 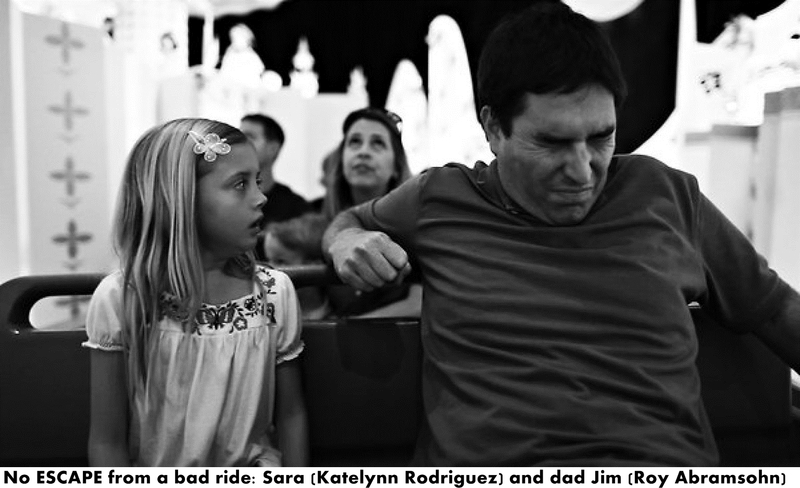 Instead, middle-class dad Jim (Roy Abramsohn) stumbles onto a kind of theme park noir on a visit to Disney World with his wife Emily (Elena Schuber) and young children Sara (Katelynn Rodriguez) and Elliot (Jack Dalton). Some of what befalls him is undoubtedly his own fault. Stalking French teenagers is not the wisest move and getting distracted by shiny things, like the necklace worn by an aging and tawdry former princess (Alison Lees-Taylor), can only lead to trouble. But the entire day takes on a surreal and horrifying vibe when rides turn out to be far less placid than they appear, Epcot has its own resident mad scientist (Stass Klassen) and even little Elliot appears to have malevolent intentions.